So, it’s the day after tomorrow! Some Australian’s are ecstatic, others are devastated. As always, I’d like to to a look at exactly what a new government will mean for Australians. Because being Prime Minister doesn’t give you the ability to just pop decisions through parliament as you choose. 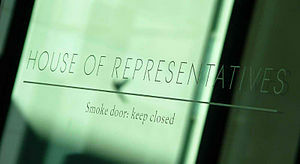 – There are two “houses” of people who represent Australians. Once’s called the Upper House/The Senate which is where the “Senators” live – once is called the Lower House – or as you may know it The House of Representatives. The Lower House is the place where you vote in the government at the prime minister BUT it is not the house that actually has the final say. The Senate does. So to connect this all back to YOU: on your voting card – the Green one was the one that you used to vote in people from your local area to the Lower House, and the white one, you used to vote in representatives of your whole state to the Senate/Upper House. Most people know the people on the Green card cos it’s their local area, but generally there’s less of an emotional connection to the white piece of paper – not to mention it takes an hour to fill in the preferences so most people just vote for a party instead of individuals and then let the party decide where to send the other preferences. Often it’s much easier for smaller parties to get into the Senate than into the House of Reps.
– Alright so…off this bill (idea) goes – get’s presented generally first at the Lower House (House of Reps) although in some cases it can come the other way (unless its any money or tax related stuff). And just to give you a sense of scale, government usually gets 200 of these proposals a year and about 80% of the actually end up becoming laws (or amendments to existing laws). Anyway, at this first presenting of the bill, everyone gets a copy. – No one chats about it or debates it this first time, it just gets presented. Ministers and members of parliament then have time to go off, read it properly, do their own research, consult experts – basically do whatever they need to do to come to their own decision about whether they want to support it, reject it or amend bits and pieces of it. – When they meet again, everyone votes in general on whether they want to run with it or not. If it’s a yes, there’s a public enquiry into the bill and then an opportunity for members to discuss it all in detail, then there’s another vote and if it’s a goer – get gets passed on to the Senate. The Senate then goes through basically the exact same process. So they’re kind of like a second pair of eyes that I think tend to look at things from more of a national rather than local community perspective. If there’s a bill introduced that fails to get through this WHOLE process TWICE, then the Prime Minister can ask the Governor General to “dissolve” both houses of parliament (hence the term “double dissolution”!) and then have another go at the election! There have been 6 cases of double dissolutions since the federation was formed. In one case, the bill was dropped, in 2 cases – the government who requested it in the first place lost their power and in 3 cases the the government “won”. So that’s basically a 50/50 chance of getting back into power…let alone letting the bill pass through! All in all, you’d need to be a betting man or woman to decide to call one I reckon. So why would you want to call one? Often this is if a party won because they won the majority in the House of Reps but didn’t get a majority in the Senate and so they’d call that a “Hostile Senate” – or basically a review panel that rejects the bills the are trying to pass. BUT…I think to be strategic about it – you’d want to think about whether the bill you were trying to pass is actually worth the risk of a loss. 1. Usually it happens when they are trying to implement a key policy that they promised the people during an election campaign, which means it happens about 6 months after they get into government. For the average citizen this isn’t enough time for that government to have proven itself or to have really made any positive changes based on their new governance. It’s not long in government but its a long time in the real world – so people begin to have doubts about the governments ability to do its job and deliver what it promised those who voted for them. Alternatively, the government has been in for a few elections, slowly losing ground and the re-election is called after 3 years, when perhaps the government hasn’t done as much as the people “thought” it would. 2. They underestimate the gap between people’s voting choice and their individual views on certain issues – so if the media reports (as they would) that the whole reelection is around a particular issue that perhaps is more contentious even between people who vote for a party, then people will be more attuned to that issue in particular in the reelection – i.e. they’ll vote almost based on whether or not they agree with that particular bill. It’s a key psychological shift, but I reckon that’s what happens. So with that in mind, it got me wondering – I know that yesterday by preferences, Liberals won by less than 6% (apparently that’s a lot in Australia) based on the votes of about 14 million Australians, and the biggest swing was toward independent parties – which showed that lots of Aussies just didn’t like either party but kind of didn’t get a choice since there wasn’t another big enough party in the contest. So given that…it’s likely people probably disagree on a case by case basis with the actual policies being proposed, which also means there will be a more hostile senate because minor parties have been able to gain more seats than previously…which in turn means, there is more likely to be a scenario where bills get rejected by the Senate and that Tony Abbott will have the opportunity to ask the Governor General for a double dissolution. 1. Scrapping of the NBN: Men are more likely to vote for liberal, but men are ALSO more likely to be interested in broadband/technology – which suggests to me that a dissolution called on the basis of the scrapping of NBN as currently planned could actually change the re-election results. 2. Gay marriage: has majority support amongst both sides of voters (liberal and labor). This hasn’t really been a major focus of the campaign – apart from Rudd saying he’d allow his party a conscience vote on it. I think both sides should listen to the Australian people on this and call a referendum. It should not be up to a government to decide this if there is support amongst the whole community because it suggests that community’s overall views are not being properly represented. 4. Mining tax: The majority of Australians actually want this! (59%) So it’s kind of hilarious that this is was what got Ruddster kicked off his perch in the first place (when he should have called his own double dissolution as he was at the height of his popularity at that time). The liberals are calling for mining tax CUTS despite what the majority of Aussie’s want. The issue here is, again the Senate – because minor parties are more able to gain seats and Queensland holds a lot of them and I’d say in both Queensland and WA where mining is most prominent, people are much more likely to be “for” mining tax cuts in their industry. Also now that The Clive Palmer Party (who has is a Billionaire mining magnate) holds three seats in the Senate and could be the deciding party if it was a vote for the tax cuts with the Liberal party, he would likely have significant power in that vote. So I think the tax cuts will definitely make it through the Senate. 5. Legalised voluntary euthanasia: A whopping 75% (plus 10%) neutral – want this. This wasn’t even an agenda with either party – I think perhaps because while people might vote for it privately…its not exactly an upbeat thing to talk about. But I do hope there is a bill brought in to assist the government agenda and help it reflect the views of the people. 6. Car Industry Support: No one in SA actually cares. They don’t want their own industry supported and Liberals agree. So I think this one will be a no brainer as I don’t see the Greens supporting Labor against cutting the support in the Senate. 7. Climate change/Carbon Tax: This one is a really interesting one because overall 61% of Aussie’s think more should be done for the environment. Also women and young people are more likely to agree with the statement vs male/older people. (but it feels like most people don’t think the Carbon tax is it – although I’m not sure how many people actually understand it). So the Liberals want to get rid of the carbon tax (in effect, a negative action against the environment) – and this is the one that Liberals believe is most likely to receive a hostile response in the Senate because it was a deal that both Labor and Greens had already agreed on (although who knows how the Palmer United Party would vote on this…given that they’re in the mining biz – they’d likely side with the Liberals on this…although given how Clive has been treated during the election campaign he may have other plans!). So anyway, assuming it went through twice and they were unable to get it through, and a double dissolution was asked for – and assuming Australian’s voted in the way of “for or against the tax” rather than for or against the party AND assuming that by that time the Labor had a strong opposition leader who was polling well, then Labor could win back the election. Let’s not also forget that 25% (500k) young people didn’t enrol to vote before this election. And the number of new young people eligible to vote will go up. We could assume they would be prompted to enrol if there was an issue at stake they were more likely to care about and the difference of another 200-300k voters plus 50k people will die of old age in that time too who may have been likely to vote “against” the tax. However if there was no leader and there was significant media surrounding the tax and confusing people into thinking having it is a negative, then Liberals could win back their seats AND win back more of the Senate. Jury is out on this one. I think there would be a 50/50 chance here. Then its important to look at the likelihood of success to win IF you take into account how strong the hold on the house of Reps or the Senate was at the time the dissolution + re-election was called by the government. The 1975 Double Dissolution I wont count because it was a requirement for Malcolm Fraser to do this after the Governor General dismissed Whitlam so it was not related to any bill. BILL IN QUESTION (6): Electoral bill (changing how electorates were divided) and same for Senate, Health insurance bill which would provide for creation of universal health insurance with Medibank – now known as medicare) and the establishment or a Petroleum and Minerals Authority. B. In 2 out of the 5 cases, the party who called the dissolution lost. Where they did win, in 2 out of the 3 cases they still didn’t win majority in the senate, only in 1951 did the party win and get Senate majority. C. Both Fraser and Menzies had the exact same majority number (74) in House of Reps and yet one lost, and the other won – which suggests deciding factors are about length of time in govt before the dissolution is called and also the issue itself. PREDICTED OUTCOME: The situation is closest to the Fraser govt BUT, the timing is different. I still say there’s a 50/50 chance of it going either way. I think that if held 6-12 months after election, they would be reelected BUT they still wouldn’t get Senate majority. If held in 3 years, they’d lose. How to tell if that new research study your friend posted on Facebook should be shared…or deleted.